At California's San Diego State University (SDSU), students from the journalism and geology departments recently collaborated on a 15-week live news and science experiment to explore the air quality in four San Diego neighborhoods: Barrio Logan, Logan Heights, Chollas Creek, and Bankers Hill. Funded by a grant from the Online News Association, students built sensor kits (based on open-source technology) that measured particulate matter and different gases—such as liquefied petroleum gas, isobutane, methane, and smoke—in the air. 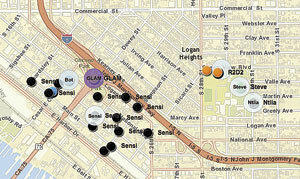 They then used Esri software to map and analyze the information collected by the sensors. In the end, the students produced nine news stories and two videos for inewsource.org, an independent, data-driven online news organization based in San Diego. Bound by mountains on most sides and beset by dry air, with quintessential Southern California freeway congestion and the state's fourth-largest maritime port, San Diego tends to attract and retain pollution. The American Lung Association's "State of the Air" report for 2015 ranked San Diego 35th out of 180 cities for the number of days with high levels of ozone pollution, or smog. The report also ranked the San Diego area 39th for the average amount of particle pollution (a medley of extremely small liquid and solid pollutant particles) present during a 24-hour period and 40th for the levels of particle pollution in the air annually. This is actually a significant improvement from 2011, when San Diego ranked 7th for ozone pollution and 15th for short-term particle pollution. To sustain—and hopefully accelerate—these improvements in air quality, it helps to know what is in the air. 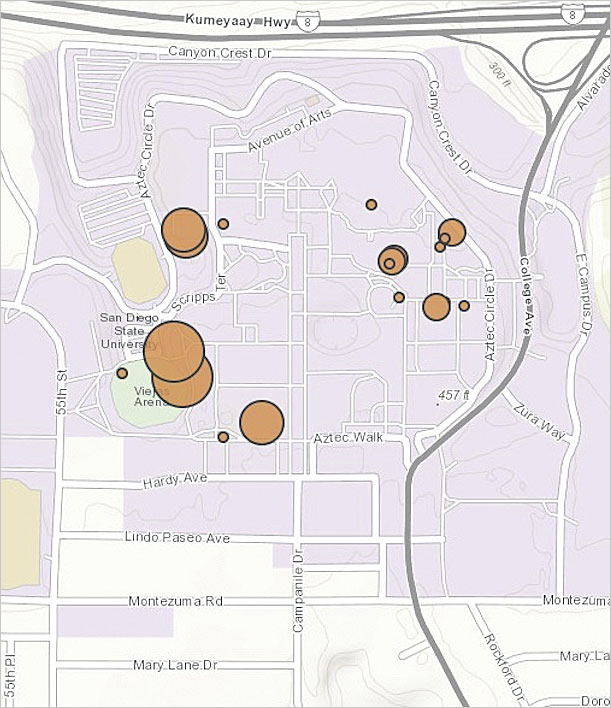 From early February to late April 2015, students in SDSU's digital journalism class monitored the air quality in different parts of San Diego with the ultimate objective of better informing the public about the area's pollutants and their effects. 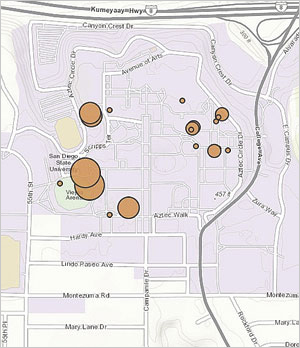 Underlying all these observations were the students' ArcGIS Online maps. Those made the data meaningful and animated the science. 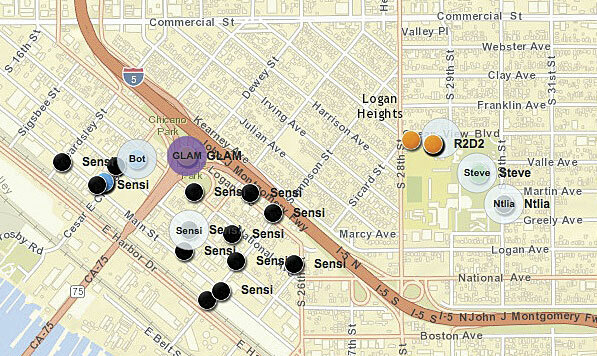 The sensor journalism project engendered a truly collaborative environment. It brought together students from different majors, teachers and faculty from various SDSU departments, and journalists from within the community. And GIS served as the foundation for everyone's exploration and research. The air quality information displayed on the class's final map, which amalgamates all the pollution recordings the students took in their assigned neighborhoods, helps supplement existing air quality data. It guided the students as they did further field investigations, studying wind patterns and conducting interviews. It also helped them hypothesize about and analyze pollution patterns, sources, and impacts in San Diego's neighborhoods.